@Mentions on Instagram are here! Earlier this year, Instagram made some major changes to the use of their API in an effort to protect user's data & privacy and to help businesses better use Instagram to build their brand and engage with their audience. Here at Photoboxx, we are really excited about one of these key changes that now allow brands to engage with their Instagram audience in a new way. @Mentions are finally here for Instagram! Photoboxx now prints social media images at your event that @Mention your brand on Instagram! It works just the same as the Photoboxx #hashtag printing you're familiar with, just instead of posting a picture to social media and including your event #hashtag to get a photo print, attendees just @Mention your brand’s username in their post. As a brand, this gives you more opportunities to boost brand awareness, increase your followers, and interact easily with your audience. 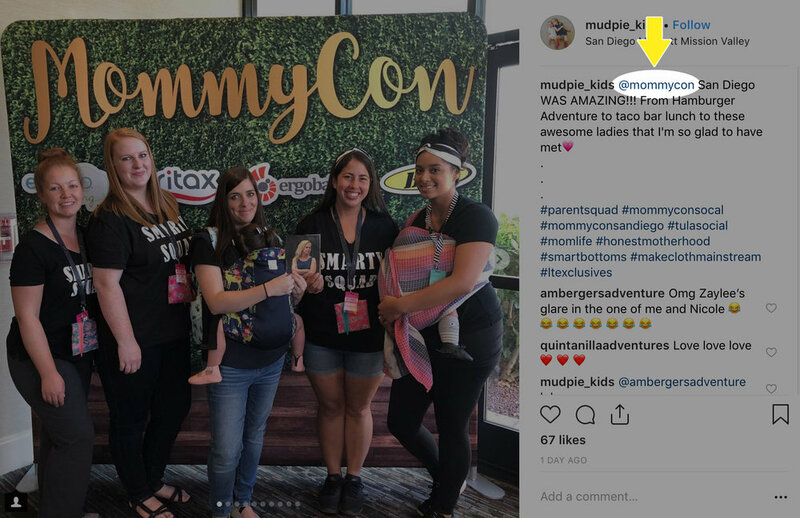 When users @Mention a brand on social media, it is a clear indication that the user is creating a connection with that brand. Those users are now organically linked to your brand accounts on Instagram and Twitter. In order to use @Mentions for your events, you'll need to link up an Instagram Business Account on Socialdrip. If you aren't already using an Instagram Business Account, they are free and easy to create! Follow the instructions here. Here are some of the other great features you’ll have access to when you switch over to an Instagram Business account. Instagram business profiles allow you to easily track and manage your profile @Mentions. You’ll be notified whenever your business profile is tagged in post captions, images and comments, allowing you to respond and interact with your audiences. Connecting you with your audience through their images and comments, you’ll be able to gauge the overall perception surrounding your brand. Converting to an Instagram business account makes it easy for customers to find your contact information. Key contact information will be displayed as buttons at the top of your profile, giving customer the ability to reach you with a click of a button. You’ll have the ability to choose which contact information is displayed, such as Call, Email, and Directions. Instagram Insights, Instagram’s built in analytics tool, gives you access to key metrics such as impressions, reach, website clicks and profile views. Insights also includes information about your audience, such as age, gender and location. These insights will help you understand how your content performs and what your audience likes to see at different times of the day. You’ll also be able to view analytics for Instagram Stories. Having access to analytics with an Instagram Business profile is key to understanding your audience, optimizing your content, and evaluating your overall presence. With an Instagram Business profile, you can boost existing posts with a budget to help give them more reach as an Instagram ad or you can use Facebook Business Manager to create an Instagram ad from scratch. Instagram advertising works great to grow your followers, boost brand awareness, promote campaigns and generate leads. Instagram Ads use the same tools as Facebook, so you can set up, target, run, and track campaigns the same way you do with Facebook. Instagram business accounts give you the ability to schedule posts, (through verified third party tools) without having to approve the post again at the time of scheduled posting. Now you can schedule your entire week of instagram posts at one time and be done, without having push notifications interrupting you at all hours. Keep in mind, this feature is through third party Instagram and Facebook partners like Hootsuite, not through the Instagram app itself.